The end of the school year is full of events and celebrations. With proper planning and tools, you can take the stress out of group organizing and make your event the best yet. Plan a class party with games and decorations. Be sure to recruit volunteers who can assist with activity stations or bring food items. That way, you can delegate activities and snacks to others with a sign up. Organize party food sign ups or collect money from parents to purchase snacks for the celebration and ensure you have all the supplies you need. Genius Tip: Need more ideas? 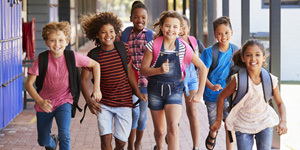 Try these 25 fun ways to celebrate the end of the school year. Field Day is a favorite tradition of most elementary schools as summer break approaches. Plan a fun day with these 50 games and activities, then create a volunteer sign up with slots for people to set up, run stations and clean up. If you are planning a preschool graduation, make sure invitations go out at least a month in advance for the ceremony. Get started early in order to collect artwork, photographs and other items to showcase at the graduation. Genius Tip: Use these 25 preschool graduation tips and ideas for inspiration on your ceremony. For high school graduation party planning, coordinate with guests of honor (such as grandparents) to make sure they can attend before you set a date. Send custom party invitations with an RSVP sign up, and decide with your graduate if they would like a particular party theme. Mobilize a group effort when you collect money for a group gift to present to your graduating student. Whether it’s for AP Exams or end-of-year testing, exams require an army of volunteers. Recruit test proctors with a sign up. Volunteers will automatically get reminder emails so they do not forget! Genius Tip: Set up custom reminders to communicate specific volunteer information. Do your students need extra help to get ready for testing? Schedule volunteers for tutoring sessions to help students prepare. High school and college students can organize people and divide preparation by topic with a study group sign up. Don’t let the end of the year slip by without showing teachers and school staff that you’re appreciative of all they do! Start with these 50 gift ideas for teachers that fit all budgets. Want to go big? Boost giving by sending a sign up where parents can pay online to contribute to a group gift for a teacher. With these tips and resources, you’re ready to conquer the end of the school year! You can finish strong without all the stress.